In most cases the majority of electricity produced by domestic solar systems is exported from the house to the local grid rather than being consumed by the house demand – electricity is produced in the day when there is low demand and not available in the evening when demand is high. A south facing PV system will produce in excess of 20kWhrs from April onwards on a bright day, purchasing this amount of energy at a standard tariff will be approximately £2.80 / per day. Being able to store generated electricity for use when demand is high is the “missing link” with domestic PV. Battery systems are however now available to store generated electricity thus maximising what is termed “self-consumption” and thus maximising the PV system. The battery technology in general will be either lead acid battery’s or Lithium Ion type with some systems being connected to the DC side of the PV system and some to the AC side. It is also possible to provide an emergency back-up of AC power in the event of a power cut. Systems can be retro-fitted or specified when installing a new PV system. 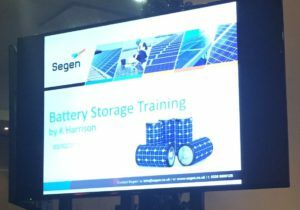 Specifying the correct system to suit individual needs is essential when considering battery storage, the “One fits all” philosophy certainly isn’t applicable to battery storage! Please contact us should you wish to discuss the technology further.